The crocuses I planted last fall are starting to push their way through the earth I cleared for them along the path to our front porch. This year, I feel a special affinity with these little harbingers of spring. I see myself in them, pushing out of a dark and cold place. That I planted them carries a particular sense of satisfaction. There are a million examples of spring as a metaphor for rebirth and human metamorphosis. Less has been said about how to do the planting. We all go through funks in our lives, for different reasons, some deeper than others. My most recent funk was all about grief—grieving for the unexpected loss of my sister Kirby, in October 2009. Unfortunately, we will all experience that particular type of funk in our lives at some point. How we experience it, how we get through it is different for everyone. But some of the things I’ve learned I think are applicable to anyone in any type of slump. Ok, no, rephrase that. I’m not sure I’m ready to give hard and fast advice. I don’t know that I’ve figured it all out yet. I just want to share some things I’ve observed to this point. After Kirby was killed, I didn’t fall apart completely. But I’ve just been simply maintaining myself, literally, through this grieving time. I tried to get enough sleep, tried to eat well, washed my face every night before bed. Ultimately, I still took care of myself in the most basic ways. But really, I was just running on a skeleton staff, at minimum capacity, simply existing but not growing. Hibernating. But Now: it is time to push ahead. At some point, I just said I have to DO something. Anything. I’m not big on New Year’s resolutions, but I did have two this year: write in my journal and do yoga. I’ve always known, looking back at various points in my life, that I’ve been at my best when I write and when I exercise. These are the things that keep me healthy emotionally and physically. I have been doing yoga every weekday morning now (skipping just a few here and there). The journal writing started strong, too. And the results? I believe I am beginning to experience my own personal spring. I honestly feel a lot of light coming back to me, warming me up and illuminating a way forward. Two small steps, and I feel like I’ve leapt from a high dive platform, now enjoying the rush of air all around me. I said my journal writing started strong, suggesting it didn’t keep. In fact, it did get a bit spottier after I started this blog, but I’m not too upset about that. This is even better—it feels like progress. So back to those crocuses. I planted them this past fall, about a year after Kirby’s death. I was still in a deep fog. But somewhere inside of me, I knew it wouldn’t last forever. 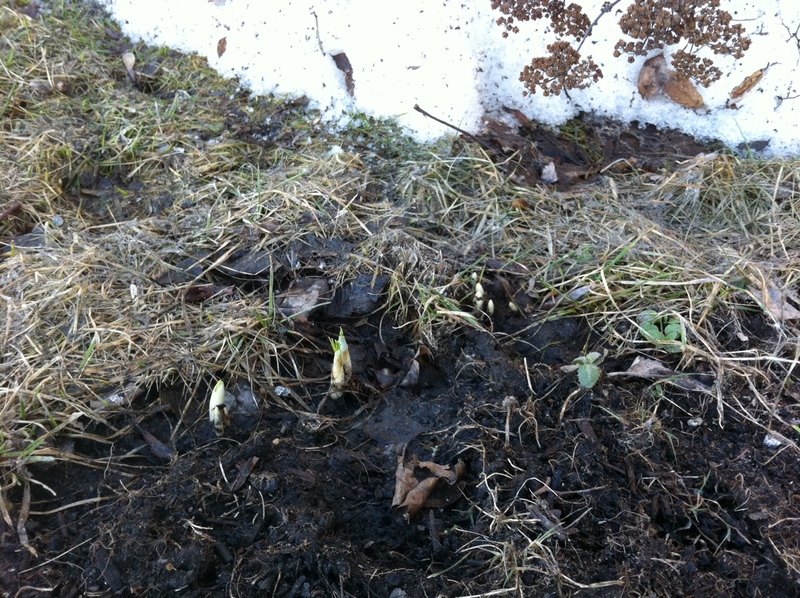 And now, those crocuses are emerging. I suppose I do, then, have one teeny, tiny piece of advice so far, for anyone trying to get out of a funk of any sort or just trying to push ahead, to grow, to change, to self-style her life. Do what you know you need and love. You’ll be blooming before you know it. Thanks for reading and sharing your blog! Jean, I like your reflections here on getting through a funk, and I think “start small” is such perfect advice. I have to remind myself of that all the time or I get overwhelmed and end up just as stuck in the funk as before. I also liked hearing that you are pushing ahead. Resilience! Go Jean! Thanks, Mon! Yeah, I think for a while I was feeling down on myself that I wasn’t being more productive or didn’t have more energy. I think we put too much pressure on ourselves–it’s much easier when we can let go of some of it and just take small steps!